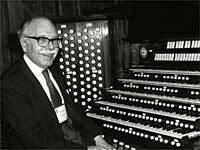 Maurice Merrell has had a life-long involvement with all aspects of organ and church music. He is an organist of much experience, and was for thirty years Organist and Director of Music at the Central London church of St. George, Bloomsbury. There he played for a wide range of services, bringing him into contact with choirs and soloists, and also planning and organising many prestigious recitals and concerts. He is Managing Director of the well-known and long-established firm of organ-builders Bishop and Son, a position he has held for many years. Besides being a Fellow of the Incorporated Society of Organ Builders (also serving on the Council) he is a past President of the London Organists’ Guild and President of the Society of Crematorium Organists. Maurice Merrell is a Founder Member of the Guild of Musicians and Singers and was elected a Fellow of the Royal Society of Arts in 1981.